Ecological research and conservation practice frequently raise difficult and varied ethical questions for scientific investigators and managers, including duties to public welfare, nonhuman individuals (i.e., animals and plants), populations, and ecosystems. 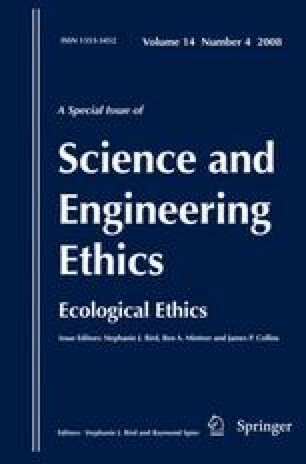 The field of environmental ethics has contributed much to the understanding of general duties and values to nature, but it has not developed the resources to address the diverse and often unique practical concerns of ecological researchers and managers in the field, lab, and conservation facility. The emerging field of “ecological ethics” is a practical or scientific ethics that offers a superior approach to the ethical dilemmas of the ecologist and conservation manager. Even though ecological ethics necessarily draws from the principles and commitments of mainstream environmental ethics, it is normatively pluralistic, including as well the frameworks of animal, research, and professional ethics. It is also methodologically pragmatic, focused on the practical problems of researchers and managers and informed by these problems in turn. The ecological ethics model offers environmental scientists and practitioners a useful analytical tool for identifying, clarifying, and harmonizing values and positions in challenging ecological research and management situations. Just as bioethics provides a critical intellectual and problem-solving service to the biomedical community, ecological ethics can help inform and improve ethical decision making in the ecology and conservation communities. Research for this paper was supported by a grant from the National Science Foundation (NSF grant # SES 0527937). The authors would also like to thank Stephanie Bird, Kim Cuddington, and Elizabeth Farnsworth for their helpful suggestions and comments on an earlier version of this paper. McCoy, E. D., & Berry, K. (2008). Using an ecological ethics framework to make decisions about the relocation of wildlife. Science and Engineering Ethics, 14(4). doi: 10.1007/s11948-008-9091-4. Norton, B. G. (2008). Beyond positivist ecology: Toward an integrated ecological ethics. Science and Engineering Ethics, 14(4). doi: 10.1007/s11948-008-9095-0. Frodeman, R. (2008). Redefining ecological ethics: Science, policy, and philosophy at cape horn. Science and Engineering Ethics, 14(4). doi: 10.1007/s11948-008-9100-7. Varner, G. E. (2008). Utilitarianism and the evolution of ecological ethics. Science and Engineering Ethics, 14(4). doi: 10.1007/s11948-008-9102-5. Lee, J. J. (2005). Animal rights group sues over Steller sea lion research. Seattle Times, 7/14/05, http://archives.seattletimes.nwsource.com/cgi-bin/texis.cgi/web/vortex/display?slug=websealions14&date=20050714&query=lee+steller+sea+lion. Accessed 8/31/08. Thompson, P. B. (2008). Agrarian philosophy and ecological ethics. Science and Engineering Ethics, 14(4). doi: 10.1007/s11948-008-9094-1.